where Var means taking the variance over many sample times. If the prices really follow a geometric random walk, then Var(τ)≡Var((z(t)-z(t-τ)) ∝ τ, and the volatility simply scales with the square root of the sampling interval. This is why if we measure daily returns, we need to multiply the daily volatility by √252 to obtain the annualized volatility. where H is called the "Hurst exponent", and it is equal to 0.5 for a true geometric random walk, but will be less than 0.5 for mean reverting prices, and greater than 0.5 for trending prices. If we annualize the volatility of a mean-reverting price series, it will end up having a lower annualized volatility than that of a geometric random walk, even if both have exactly the same volatility measured at, say, 5-min bars. The opposite is true for a trending price series. For example, if we try this on AUDCAD, an obviously mean-reverting time series, we will get H=0.43. All of the above are well-known to many traders, and are in fact discussed in my book. But what is more interesting is that the Hurst exponent itself can change at some time scale, and this change sometimes signals a shift from a mean reversion to a momentum regime, or vice versa. To see this, let's plot volatility (or more conveniently, variance) as a function of τ. 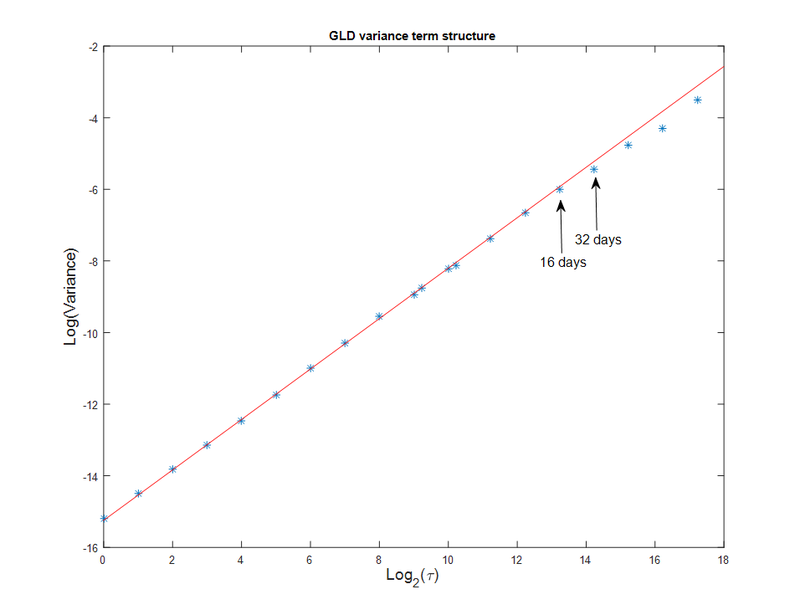 This is often called the term structure of (realized) volatility. Start with the familiar SPY. 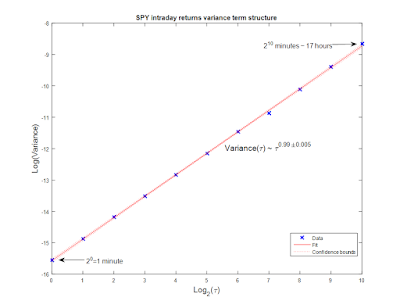 we can compute the intraday returns using midprices from 1 minutes to 2^10 minutes (~17 hrs), and plot the log(Var(τ)) against log(τ). The fit, shown below, is excellent. (Click figure to enlarge). The slope, divided by 2, is the Hurst exponent, which turns out to be 0.494±0.003, which is very slightly mean-reverting. 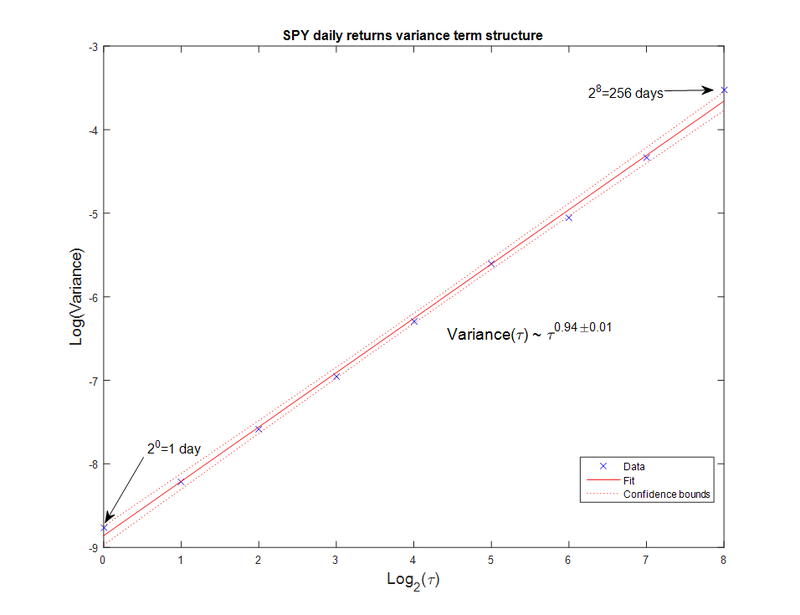 But if we do the same for daily returns of SPY, for intervals of 1 day up to 2^8 (=256) days, we find that H is now 0.469±0.007, which is significantly mean reverting. 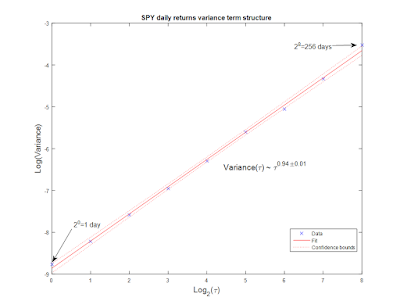 Conclusion: mean reversion strategies on SPY should work better interday than intraday. We can do the same analysis for USO (the WTI crude oil futures ETF). The intraday H is 0.515±0.001, indicating significant trending behavior. The daily H is 0.56±0.02, even more significantly trending. So momentum strategies should work for crude oil futures at any reasonable time scales. We can see that at around 16-32 days, the volatilities depart from straight line extrapolated from intraday frequencies. That's where we should switch from momentum to mean reversion strategies. 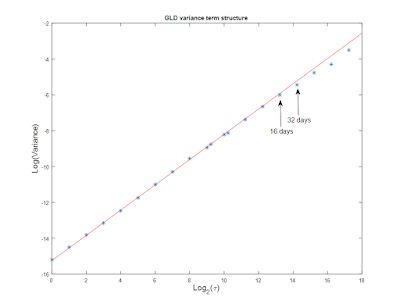 One side note of interest: when we compute the variance of returns over periods that straddle two trading days and plot them as function of log(τ), should τ include the hours when the market was closed? It turns out that the answer is yes, but not completely. 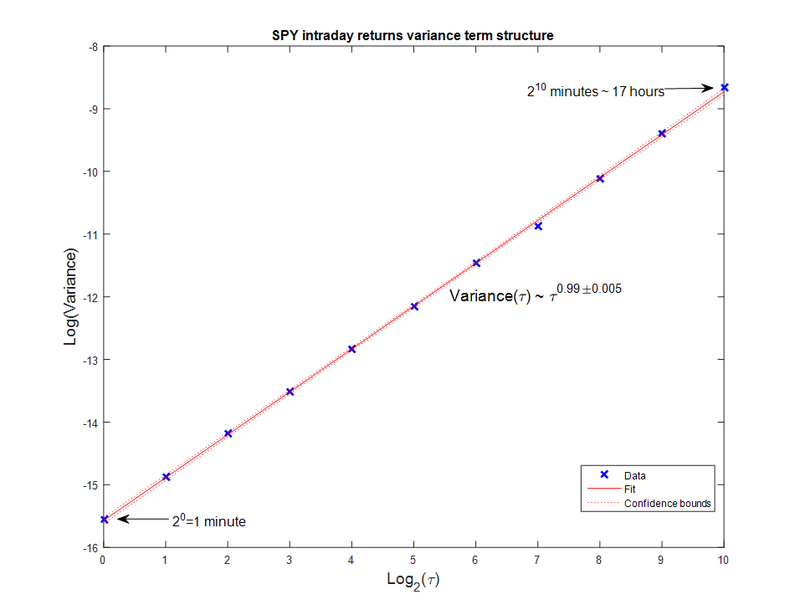 In order to produce the chart above where the daily variances initially fall on the same straight line as the intraday variances, we have to count 1 trading day as equivalent to 10 trading hours. Not 6.5 (for the US equities/ETF markets), and not 24. The precise number of equivalent trading hours, of course, varies across different instruments. Nick over at mintegration.eu discusses the new intraday databases at Quandl and Kerf. Factorwave.com (Euan Sinclair's creation) started a new forum: slack.factorwave.com. It has some very active and in-depth discussions of many trading and investing topics. Prof. Matthew Lyle at Kellogg School of Management has a new paper out that relates fundamentals to variance risk premiums: http://papers.ssrn.com/sol3/papers.cfm?abstract_id=2696183. April 20-21: Mean Reversion Strategies. There are a lot more to mean reversion strategies than just pairs trading. Find out how to thrive in the current low volatility environment favorable to this type of strategies.